This model just goes to show that if you give Vinny Tufano a good thing, he just makes it even better. 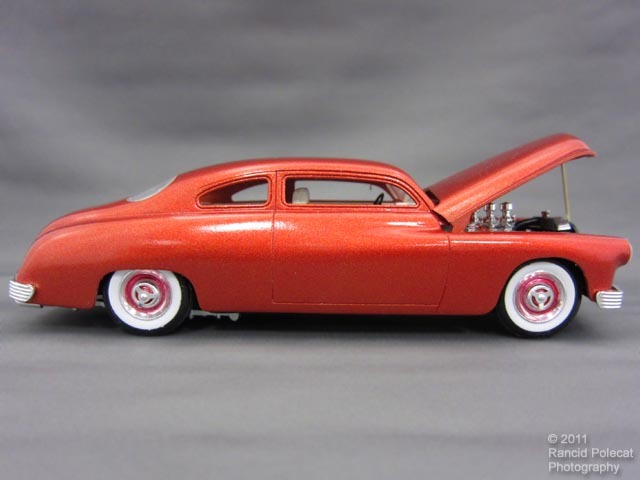 In this case Revell provided for the first time in history a model kit of a chopped 1949 Mercury sedan. Vinny finished the job by sectioning it above the wheel openings and blending the side contours to give the car almost Hudson-like sides. Vinny topped off his body work with Dupli-Color Metal Specks Burnt Copper paint and a generous amount of clear coat.